Keeping with years of tradition, we still make our chocolates by hand, in small batches, using only the purest ingredients. This means that chocolates you buy at Steininger's are guaranteed fresh and of the highest quality possible. No detail is overlooked. Our chocolates are a delight to the eye and nose and are excruciatingly delicious! 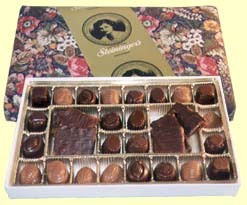 You can order our chocolates right now and they will be delivered promptly to your door. Or you may have them sent to friends as a gift for a special occasion, a token of appreciation, or "just because." You hardly even need a reason to indulge in chocolate! Especially chocolates as fine as ours. You'll also want to be sure to look at our line of Homemade Jams and Chutneys. Our unique blending of nature's best flavors creates jams that blend beautifully on the toungue. Our Chutneys, spiced fruit and vegetable relishes, will enliven your entrees and inspire you to serve poultry, pork, and even sandwiches, in new ways. These are the same condiments we use here in our restaurant. Chambord Truffle Creamy light chocolate center flavored with Chambord and covered with dark chocolate. Himbeere Raspberry marzipan truffle surrounded by dark chocolate. Hazelnut Gianduja A smooth blend of milk chocolate and fine roasted hazelnuts, covered in milk chocolate. Elsa Hazelnut praline and marzipan flavored with Kirsch in a coat of fluted milk chocolate. Grand Marnier Truffle A center of creamy light chocolate flavored with Grand Marnier and housed in dark chocolate. Verdi Candied orange peel marinated in a light rum and blended with marzipan within dark chocolate. Boules d'Orange Fine dark chocolate praline and candied orange hidden in a shell of milk chocolate. Genevoise A praline and crocant-textured filling in a tall column of dark chocolate. Winter's Leaf White chocolate and minced roasted almonds fashioned in the shape of a leaf. Crocant Almond brittle between layers of light milk and rich dark chocolate.